Shy and solitary, the Hawaiian hoary bat is so rare that most people have never seen one. But if you are in the right place (the edge of a forest) at the right time (around sunset), you may be lucky enough to catch a glimpse of one heading out to hunt for beetles and moths, its favorite foods. 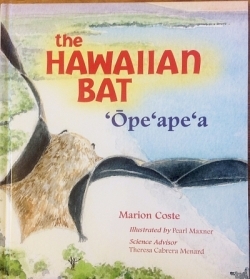 These and other fascinating details about the Islands' only native land mammal and bats in general can be found in this book. Far from being the frightening creatures of myth and legend, bats actually help humans by scattering seeds and pollen and eating insect pests. The more we know about this mysterious and misunderstood animal, the greater our chances of protecting it and its fragile habitat.